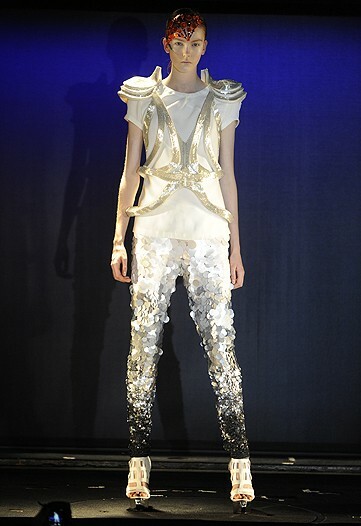 Manish Arora’s Spring 2010 collection was out of this world – or it was at least inspired by planets beyond ours. 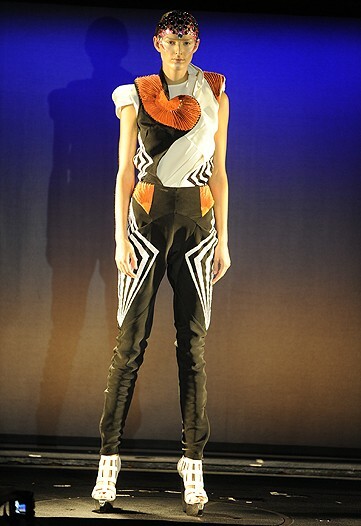 The London-based Indian designer is known for pushing fantastical limits. This time, that sense of fantasy took him to intergalactic heights. The seasonal trend of all things shiny and studded is continued – it’s just, um, elevated. The suit has also quietly been making a comeback. I’m not sure if the grey number is a suit or a dress, but the padded shoulders and lapel suggest the idea of a jacket. Space travel suits me just fine. There’s also a nod to the military and to the studded belts from the ’80s – all very on trend – but exceeding them at the same time. It all becomes so new when Mr. Arora dreams. Take the humble t-shirt with leggings, and the play on another big item this season – the vest. He even makes the jumpsuit jaunty. Jumping Jupiter, it's the embellished jumpsuit! Loved the suggestion of a traditional Indian sari belt over pants. Hmmm…that gives me an idea or two…. There was of course, Arora’s trademark use of colour and print. These dresses are oh, so wearable even here on Earth. Marvellous on Mars - or even here on Earth! Captain Arora, thank you for the ride through the universe. Captain Arora, of the Styleship Enterprise, in simple black.